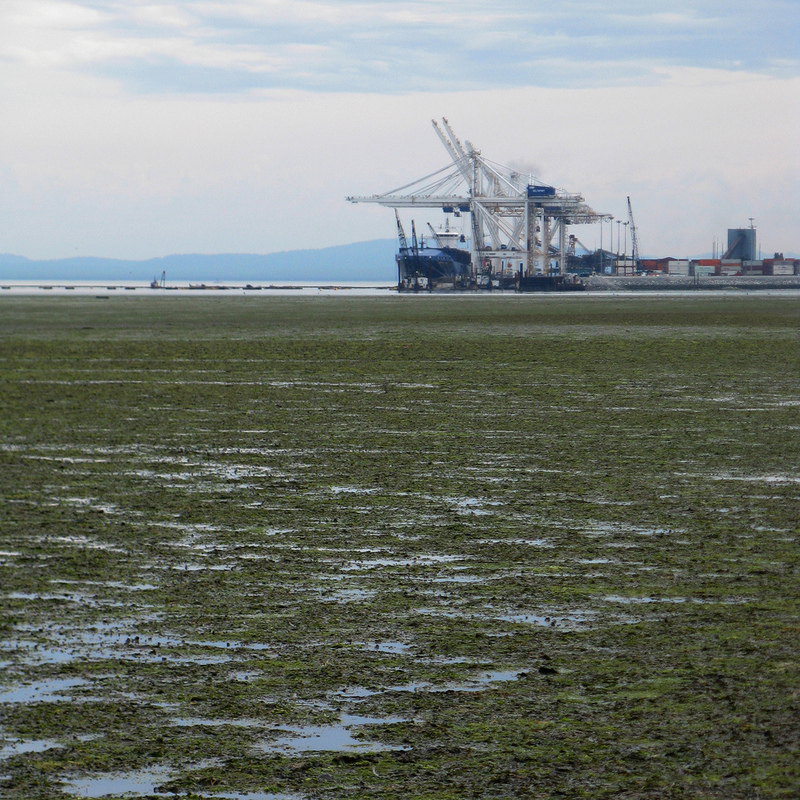 If you have ever been to an estuary in the Salish Sea, then you’re probably familiar with the scuzzy green stuff that sits atop the mud when the tide is out. And when it got all over your shoes, you may have even referred to it by one of several less-than-flattering nicknames: scum, slime, snot. The scum/slime/snot is actually a living assemblage called biofilm: a dense layer of diatoms, primarily, along with organic detritus and sediment, all of which is held together by the microbes’ sticky cells to form what biologists refer to as a mucilaginous matrix. Biofilm was known to be a food source for benthic invertebrates, as well as a few species of fish, but only recently have scientists begun to understand better just how central a role it plays in the lives of migrating shorebirds. And this knowledge could have significant implications for development projects proposed in sensitive estuaries. 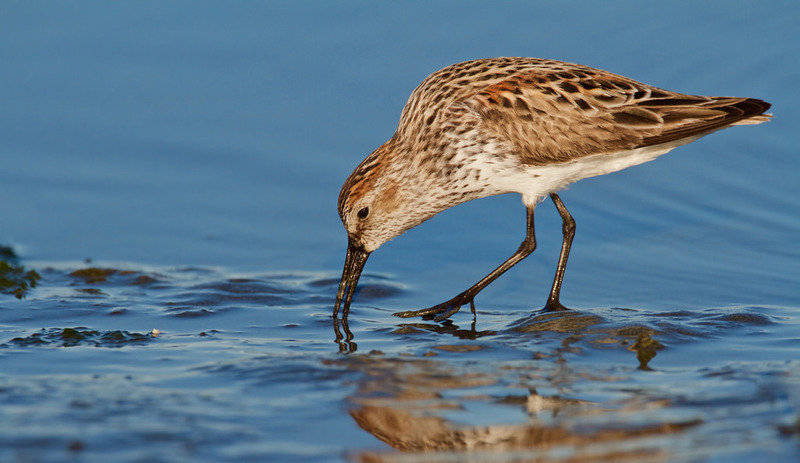 That shorebirds might depend on biofilm for food was not suspected until recently. Earlier diet studies found high sediment loads in the guts of some species, but that was assumed to be an artifact of their ceaseless probing for worms and other invertebrates. But in 2008, a group led by Tomohiro Kuwae, an ecologist with the Port and Airport Research Group in Japan, decided to take a closer look. Using video recordings, stable isotope analysis, and stomach contents, Kuwae and his colleagues showed that several shorebirds frequently graze on biofilm, scooping it up with their tongues and gulping it down. In 2012, Kuwae co-authored a paper in Ecology Letters that described for the first time the direct link from biofilm to one species, the Western Sandpiper, estimating that biofilm accounted for up to 59% of its total diet, or roughly 50% of its energy budget. Other studies have since elaborated on the relationship between shorebirds and biofilm all over the world. But the relationship in the Salish Sea, and Roberts Bank in particular, was the focus of one project described at the recent Salish Sea Ecosystem Conference, in Vancouver, Canada. But humans can be drawn to estuaries just as the birds are, and Roberts Bank is the site of one of the largest ports in Canada. In their present configuration, at the end of a four-kilometer-long causeway, the port’s two terminals have the capacity to support 3.1 million twenty-foot equivalency units, or TEUs. (Each TEU is roughly the size of a standard shipping container.) The Port of Vancouver is looking to build a third terminal at Roberts Bank, which would help increase the port’s capacity by an additional 2.4 million TEUs. 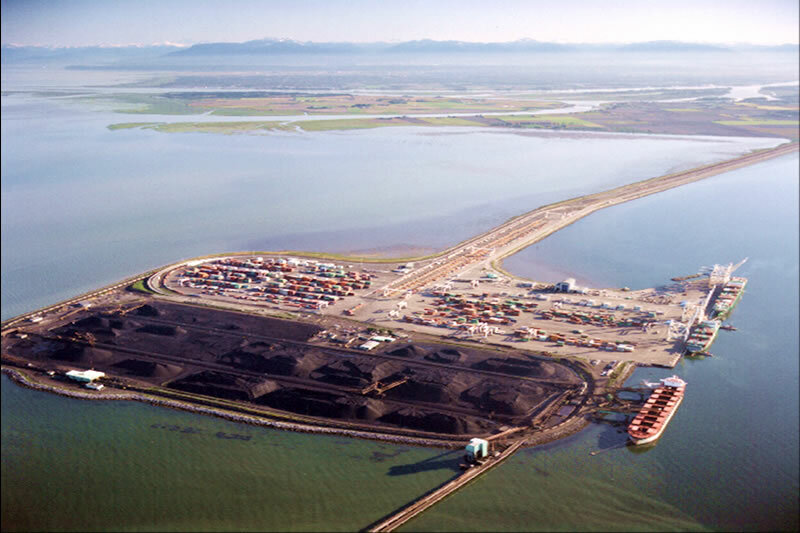 The Roberts Bank port is also Canada’s largest coal export terminal, handling more than 33 metric tons of coal per year. How much the port’s proposed expansion might affect migrating shorebirds isn’t clear, but it was a question that James Rourke, a senior biologist with Hemmera, an environmental consulting firm, tried to answer. Rourke was part of an interdisciplinary team of scientists, including biologists, hydrogeologists and spatial modelers. Ecologists worry that the water’s temperature, salinity, and currents could be affected. As Kuwae had before, Rourke and his team focused on Roberts Bank’s most abundant visitor, the Western Sandpiper. Although historically the estuary could support sporadic peaks of as many as 500,000 Western Sandpipers in a day, that number now usually falls between 120,000 – 180,000. Still, it represents between 14% - 21% of the flyway population, and sometimes up to 64%. Earlier work suggested that biofilm made up more than 60% of the Western Sandpiper’s diet. To estimate how much biofilm Western sandpipers ate at different levels of attendance during their spring migration, Rourke first had to determine how extensive biofilm coverage was. He found it was spread over more than three square kilometers of intertidal habitat. Although he didn’t dwell on it, Rourke’s work was done as part of an environmental assessment for the proposed port expansion. In the end, it would seem to suggest that life will go on more or less as usual for Western Sandpipers and the other shorebirds of Roberts Bank. But how might the port’s expansion affect biofilm, and the 120,000 sandpipers that eat more than 20,000 metric tons of it per tidal cycle? The question concerns ecologists. To complete the new terminal, the port will need to add fill to more of Roberts Bank, and ecologists worry that the water’s temperature, salinity, and currents could be affected. Biofilm is so abundant at Roberts Bank in part because it benefits from nutrient and freshwater input from the Fraser River during the spring. And one map showed that most of the biofilm is found north of the port; south of the port, there was considerably less, although the reason for this is uncertain. In the end, it might be the questions Rourke was not asked to ask that are the most pressing. Are microscopic diatoms enough to stop a major port expansion, one the port estimates will bring nearly 1,000 jobs and contribute nearly $1.2 billion to Canada’s economy? Should they be? These are, of course, much more difficult questions to answer. Eric Wagner writes about science and the environment from his home in Seattle, where he lives with his wife and daughter. His writing has appeared in Smithsonian, Orion, and High Country News, among other places, and he is the co-author, with photographer Tom Reese, of the recently published book Once and Future River: Reclaiming the Duwamish. He is currently at work on a book about penguins.